Most buildings have fire procedures, but many do not have out of hours policies. Managers must have fire plans and also ensure persons safety at all times. Out of hours is usually before 0830 / 0900 and after 1700 / 1800 hours. The simple methods below will help ensure all persons are accounted for during these hours. A register should be placed at the reception or entrance to the place of work. The list will have two columns. One for regular staff and also another for fire marshals. All staff must sign in if they get to their place of work before usual operating hours. In the event of a fire alarm all persons should leave the building and report to the assembly point. The first person to the fire register will operate as a roll call officer. They will call out all names and report any persons missing and their possible location to the fire service in the event of a fire. However, as fire marshals enter the building, the organisation can revert to a sweep system. An additional column with fire marshals should also be listed on the fire register. If the building requires four fire marshals to operate a sweep system, the fourth fire marshal entering the building will sign in and then write SWEEP over the fire register. Any further persons entering the building will not require to sign in. In the event of fire alarm operating any person seeing the fire register will know that a roll call is not required. Fire marshals will report to the assembly point and call the fire service if a fire has been detected. (note: London Fire Brigade do operate an unwanted fire signal policy – check their website for details). A roll call will be required. This entails a list of names of all persons in the building at the reception or entrance / exit of the building. Persons must sign out. Fire marshals remaining in the building can still perform a sweep of their area as this may speed up an out of hours evacuation. The first person to the reception or entrance / exit will act as a roll call officer. Our fire marshal training includes accounting and evacuation plans of regular hours and out of hours plans. We also include information such as fire extinguishers, classes of fires and also fire drills. 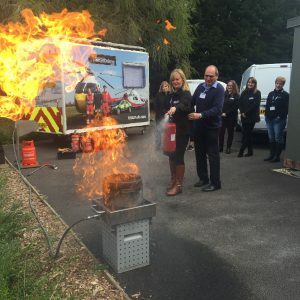 The programme includes hazard spotting, fire emergency plans, safety checks and in addition, disabled fire procedures. For more details either phone or email us now!